This article is about the language on which standard Indonesian and Malaysian are based. For the vernacular varieties and dialects of Malay, see Malayan languages. Not to be confused with Malayalam. Malay (/məˈleɪ/; Malay: Bahasa Melayu, بهاس ملايو‎) is a major language of the Austronesian family spoken in Brunei, Indonesia, Malaysia and Singapore. A language of the Malays, it is spoken by 290 million people across the Strait of Malacca, including the coasts of the Malay Peninsula of Malaysia and the eastern coast of Sumatra in Indonesia and has been established as a native language of part of western coastal Sarawak and West Kalimantan in Borneo. It is also used as a trading language in the southern Philippines, including the southern parts of the Zamboanga Peninsula, the Sulu Archipelago and the southern predominantly Muslim-inhabited municipalities of Bataraza and Balabac in Palawan. As the Bahasa Kebangsaan or Bahasa Nasional ("national language") of several states, Standard Malay has various official names. In Malaysia, it is designated as either Bahasa Malaysia ("Malaysian language") or Bahasa Melayu ("Malay language"). In Singapore and Brunei, it is called Bahasa Melayu ("Malay language") and in Indonesia, an autonomous normative variety called Bahasa Indonesia ("Indonesian language") is designated the Bahasa Persatuan/Pemersatu ("unifying language"/lingua franca). However, in areas of central to southern Sumatra where vernacular varieties of Malay are indigenous, Indonesians refer to it as Bahasa Melayu and consider it one of their regional languages. Standard Malay, also called Court Malay, was the literary standard of the pre-colonial Malacca and Johor Sultanates, and so the language is sometimes called Malacca, Johor or Riau Malay (or various combinations of those names) to distinguish it from the various other Malayan languages. According to Ethnologue 16, several of the Malayan varieties they currently list as separate languages, including the Orang Asli varieties of Peninsular Malay, are so closely related to standard Malay that they may prove to be dialects. There are also several Malay trade and creole languages which are based on a lingua franca derived from Classical Malay as well as Macassar Malay, which appears to be a mixed language. Malay historical linguists agree on the likelihood of the Malay homeland being in western Borneo stretching to the Bruneian coast. A form known as Proto-Malay was spoken in Borneo at least by 1000 BCE and was, it has been argued, the ancestral language of all subsequent Malayan languages. Its ancestor, Proto-Malayo-Polynesian, a descendant of the Proto-Austronesian language, began to break up by at least 2000 BCE, possibly as a result of the southward expansion of Austronesian peoples into Maritime Southeast Asia from the island of Taiwan. 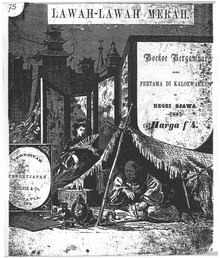 Lawah-Lawah Merah (1875), a Malay-language translation of L'araignée rouge by René de Pont-Jest [fr] has been identified as the first Malay-language novel. Prior to the era, the Malay literature & storytelling was predominantly written in the form of Hikayat. The history of the Malay language can be divided into five periods: Old Malay, the Transitional Period, the Malacca Period (Classical Malay), Late Modern Malay and modern Malay. It is not clear that Old Malay was actually the ancestor of Classical Malay, but this is thought to be quite possible. Old Malay was influenced by the Sanskrit literary language of Classical India and a scriptural language of Hinduism and Buddhism. Sanskrit loanwords can be found in Old Malay vocabulary. The earliest known stone inscription in the Old Malay language was found in Sumatra, written in the Pallava variety of the Grantha alphabet and dates back to 7th century. Known as the Kedukan Bukit inscription, it was discovered by the Dutchman M. Batenburg on November 29, 1920 at Kedukan Bukit, South Sumatra, on the banks of the Tatang, a tributary of the Musi River. It is a small stone of 45 by 80 centimetres (18 by 31 in). The earliest surviving manuscript in Malay is the Tanjung Tanah Law in post-Pallava letters. This 14th-century pre-Islamic legal text produced in the Adityawarman era (1345–1377) of Dharmasraya, a Hindu-Buddhist kingdom that arose after the end of Srivijayan rule in Sumatra. The laws were for the Minangkabau people, who today still live in the highlands of Sumatra. The Malay language came into widespread use as the lingua franca of the Malacca Sultanate (1402–1511). During this period, the Malay language developed rapidly under the influence of Islamic literature. The development changed the nature of the language with massive infusion of Arabic, Tamil and Sanskrit vocabularies, called Classical Malay. Under the Sultanate of Malacca the language evolved into a form recognisable to speakers of modern Malay. When the court moved to establish the Johor Sultanate, it continued using the classical language; it has become so associated with Dutch Riau and British Johor that it is often assumed that the Malay of Riau is close to the classical language. 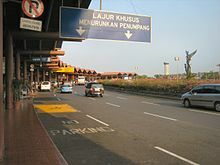 However, there is no closer connection between Malaccan Malay as used on Riau and the Riau vernacular. One of the oldest surviving letters written in Malay is a letter from Sultan Abu Hayat of Ternate, Maluku Islands in present-day Indonesia, dated around 1521–1522. The letter is addressed to the king of Portugal, following contact with Portuguese explorer Francisco Serrão. The letters show sign of non-native usage; the Ternateans used (and still use) the unrelated Ternate language, a West Papuan language, as their first language. Malay was used solely as a lingua franca for inter-ethnic communications. Malay is a member of the Austronesian family of languages, which includes languages from Southeast Asia and the Pacific Ocean, with a smaller number in continental Asia. Malagasy, a geographic outlier spoken in Madagascar in the Indian Ocean, is also a member of this language family. Although each language of the family is mutually unintelligible, their similarities are rather striking. Many roots have come virtually unchanged from their common ancestor, Proto-Austronesian language. There are many cognates found in the languages' words for kinship, health, body parts and common animals. Numbers, especially, show remarkable similarities. Within Austronesian, Malay is part of a cluster of numerous closely related forms of speech known as the Malayan languages, which were spread across Malaya and the Indonesian archipelago by Malay traders from Sumatra. There is disagreement as to which varieties of speech popularly called "Malay" should be considered dialects of this language, and which should be classified as distinct Malay languages. The vernacular of Brunei—Brunei Malay—for example, is not readily intelligible with the standard language, and the same is true with some varieties on the Malay Peninsula such as Kedah Malay. However, both Brunei and Kedah are quite close. The closest relatives of the Malay languages are those left behind on Sumatra, such as the Minangkabau language, with 5.5 million speakers on the west coast. The Rencong alphabet, a native writing system found in Malay Peninsula, central and South Sumatra. The text reads (Voorhoeve's spelling): "haku manangis ma / njaru ka'u ka'u di / saru tijada da / tang [hitu hadik sa]", which is translated by Voorhoeve as: "I am weeping, calling you; though called, you do not come" (hitu adik sa- is the rest of 4th line. 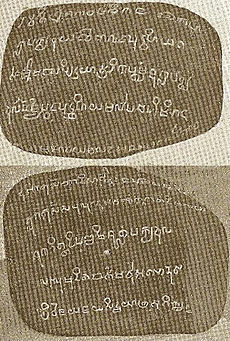 Kedukan Bukit Inscription, using Pallava alphabet, is the oldest surviving specimen of the Old Malay language in South Sumatra, Indonesia. Malay is now written using the Latin script (Rumi), although an Arabic script called Arab Melayu or Jawi also exists. Rumi is official in Malaysia, Singapore, and Indonesia. Malay uses Hindu-Arabic numerals. Rumi and Jawi are co-official in Brunei only. Names of institutions and organisations have to use Jawi and Rumi (Latin) scripts. Jawi is used fully in schools, especially the Religious School, Sekolah Agama, which is compulsory during the afternoon for Muslim students aged from around 6–7 up to 12–14. Efforts are currently being undertaken to preserve Jawi in rural areas of Malaysia, and students taking Malay language examinations in Malaysia have the option of answering questions using Jawi. The Latin script, however, is the most commonly used in Brunei and Malaysia, both for official and informal purposes. Historically, Malay has been written using various scripts. Before the introduction of Arabic script in the Malay region, Malay was written using the Pallava, Kawi and Rencong scripts; these are still in use today, such as the Cham alphabet used by the Chams of Vietnam and Cambodia. Old Malay was written using Pallava and Kawi script, as evident from several inscription stones in the Malay region. Starting from the era of kingdom of Pasai and throughout the golden age of the Malacca Sultanate, Jawi gradually replaced these scripts as the most commonly used script in the Malay region. Starting from the 17th century, under Dutch and British influence, Jawi was gradually replaced by the Rumi script. A Malay traffic sign in Malaysia. Malay is spoken in Brunei, Indonesia, Malaysia, East Timor, Singapore, parts of Thailand and southern Philippines. Indonesia regulates its own normative variety of Malay, while Malaysia and Singapore use the same standard. Brunei, in addition to Standard Malay, uses a distinct vernacular dialect called Brunei Malay. In East Timor, Indonesian is recognised by the constitution as one of the two working languages (the other being English), alongside the official languages of Tetum and Portuguese. The extent to which Malay is used in these countries varies depending on historical and cultural circumstances. Malay is the national language in Malaysia by Article 152 of the Constitution of Malaysia, and became the sole official language in Peninsular Malaysia in 1968 and in East Malaysia gradually from 1974. English continues, however, to be widely used in professional and commercial fields and in the superior courts. Other minority languages are also commonly used by the country's large ethnic minorities. The situation in Brunei is similar to that of Malaysia. In the Philippines, Malay is spoken by a minority of the Muslim population residing in Mindanao (specifically the Zamboanga Peninsula) and the Sulu Archipelago. However, they mostly speak it in a form of creole resembling Sabah Malay. Historically, it was the primary trading language of the archipelago prior to Spanish occupation. Indonesian is spoken by the overseas Indonesian community in Davao City, and functional phrases are taught to members of the Philippine Armed Forces and to students. Malay, like most Austronesian languages, is not a tonal language. The consonants of Malaysian and also Indonesian are shown below. Non-native consonants that only occur in borrowed words, principally from Arabic and English, are shown in brackets. /ð/ is 'z', the same as the /z/ sound (only occurs in Arabic loanwords originally containing the /ð/ sound, but the writing is not distinguished from Arabic loanwords with /z/ sound, and this sound must be learned separately by the speakers). Phonemes which occur only in Arabic loans may be pronounced distinctly by speakers who know Arabic. Otherwise they tend to be replaced with native sounds. /x/ /k/, /h/ khabar, kabar "news"
/ð/ /d/, /l/ redha, rela "good will"
/zˤ/ /l/, /z/ lohor, zuhur "noon (prayer)"
/ɣ/ /ɡ/, /r/ ghaib, raib "hidden"
/ʕ/ /ʔ/ saat, sa'at "second (time)"
Malay originally had four vowels, but in many dialects today, including Standard Malay, it has six. The vowels /e, o/ are much less common than the other four. Orthographic note: both /e/ and /ə/ are written as 'e'. This means that there are some homographs, so perang can be either /pəraŋ/ ("war") or /peraŋ/ ("blond") (but in Indonesia perang with /e/ sound is also written as pirang). Some analyses regard /ai, au, oi/ as diphthongs. However, [ai] and [au] can only occur in open syllables, such as cukai ("tax") and pulau ("island"). Words with a phonetic diphthong in a closed syllable, such as baik ("good") and laut ("sea"), are actually two syllables. An alternative analysis therefore treats the phonetic diphthongs [ai], [au] and [oi] as a sequence of a monophthong plus an approximant: /aj/, /aw/ and /oj/ respectively. There is a rule of vowel harmony: the non-open vowels /i, e, u, o/ in bisyllabic words must agree in height, so hidung ("nose") is allowed but *hedung is not. Malay is an agglutinative language, and new words are formed by three methods: attaching affixes onto a root word (affixation), formation of a compound word (composition), or repetition of words or portions of words (reduplication). Nouns and verbs may be basic roots, but frequently they are derived from other words by means of prefixes, suffixes and circumfixes. Malay does not make use of grammatical gender, and there are only a few words that use natural gender; the same word is used for “he” and “she” which is dia or for “his” and “her” which is dia punya. There is no grammatical plural in Malay either; thus orang may mean either "person" or "people". Verbs are not inflected for person or number, and they are not marked for tense; tense is instead denoted by time adverbs (such as "yesterday") or by other tense indicators, such as sudah "already" and belum "not yet". On the other hand, there is a complex system of verb affixes to render nuances of meaning and to denote voice or intentional and accidental moods. The Malay language has many words borrowed from Arabic (in particular religious terms), Sanskrit, Tamil, Persian, Portuguese, Dutch, Sinitic languages (due to historical status of Malay Archipelago as a trading hub) and more recently, English (in particular many scientific and technological terms). All Malay speakers should be able to understand either of the translations below, which differ mostly in their choice of wording. The words for 'article', pasal and perkara, and for 'declaration', pernyataan and perisytiharan, are specific to the Indonesian and Malaysian standards, respectively, but otherwise all the words are found in both (and even those words may be found with slightly different meanings). All human beings are born free and equal in dignity and rights. They are endowed with reason and conscience and should act towards one another in a spirit of brotherhood. Semua orang dilahirkan merdeka dan mempunyai martabat dan hak-hak yang sama. Mereka dikaruniai akal dan hati nurani dan hendaknya bergaul satu sama lain dalam semangat persaudaraan. Semua manusia dilahirkan bebas dan sama rata dari segi maruah dan hak-hak. Mereka mempunyai pemikiran dan perasaan hati dan hendaklah bergaul dengan semangat persaudaraan. Malaysian English, the English used formally in Malaysia. ^ Uli, Kozok (10 March 2012). "How many people speak Indonesian". University of Hawaii at Manoa. Retrieved 20 October 2012. James T. Collins (Bahasa Sanskerta dan Bahasa Melayu, Jakarta: KPG 2009) gives a conservative estimate of approximately 200 million, and a maximum estimate of 250 million speakers of Malay (Collins 2009, p. 17). ^ "Kedah MB defends use of Jawi on signboards". The Star. 26 August 2008. Archived from the original on 29 October 2012. ^ Hammarström, Harald; Forkel, Robert; Haspelmath, Martin, eds. (2017). "Indonesian Archipelago Malay". Glottolog 3.0. Jena, Germany: Max Planck Institute for the Science of Human History. ^ Bauer, Laurie (2007). The Linguistic Student's Handbook. Edinburgh: Edinburgh University Press. ^ 10 million in Malaysia, 5 million in Indonesia as "Malay" plus 250 million as "Indonesian", etc. ^ Adelaar, K. Alexander (2004). "Where does Malay come from? Twenty years of discussions about homeland, migrations and classifications". Bijdragen tot de Taal-, Land- en Volkenkunde. 160 (1): 1–30. doi:10.1163/22134379-90003733. ^ Andaya, Leonard Y. (2001). "The Search for the 'Origins' of Melayu" (PDF). Journal of Southeast Asian Studies. 32 (3): 315–330. doi:10.1017/S0022463401000169. ^ Wurm, Stephen; Mühlhäusler, Peter; Tryon, Darrell T. (1996). Atlas of Languages of Intercultural Communication in the Pacific, Asia, and the Americas: Vol I: Maps. Vol II: Texts. Walter de Gruyter. p. 677. ISBN 978-3-11-081972-4. ^ "Bahasa Melayu Kuno". Bahasa-malaysia-simple-fun.com. 15 September 2007. Archived from the original on 26 December 2010. Retrieved 22 December 2010. ^ Surakhman, M. Ali (23 October 2017). "Undang-Undang Tanjung Tanah: Naskah Melayu Tertua di Dunia". kemdikbud.go.id (in Indonesian). ^ Sneddon, James N. (2003). The Indonesian Language: Its History and Role in Modern Society. UNSW Press. p. 70. ISBN 978-0-86840-598-8. ^ a b Sneddon, James N. (2003). The Indonesian Language: Its History and Role in Modern Society. UNSW Press. p. 62. ISBN 978-0-86840-598-8. ^ Ethnologue 16 classifies them as distinct languages, ISO3 kxd and meo, but states that they "are so closely related that they may one day be included as dialects of Malay". ^ "Malay (Bahasa Melayu)". Omniglot. Retrieved 30 August 2008. ^ "Malay Can Be 'Language Of Asean'". Brudirect.com. 24 October 2010. Retrieved 22 December 2010. ^ Salleh, Haji (2008). An introduction to modern Malaysian literature. Kuala Lumpur: Institut Terjemahan Negara Malaysia Berhad. pp. xvi. ISBN 978-983-068-307-2. ^ "East Timor Languages". www.easttimorgovernment.com. ^ a b Clynes, Adrian; Deterding, David (12 July 2011). "Standard Malay (Brunei)". Journal of the International Phonetic Association. 41 (02): 259–268. doi:10.1017/S002510031100017X. Archived from the original on 15 October 2015. Retrieved 3 November 2014. .
^ Soderberg, Craig D.; Olson, Kenneth S. (2008). "Indonesian". Journal of the International Phonetic Association. 38 (2): 209–213. doi:10.1017/S0025100308003320. ISSN 1475-3502. ^ Asmah Haji, Omar (1985). Susur galur bahasa Melayu. Kuala Lumpur: Dewan Bahasa dan Pustaka. ^ Ahmad, Zaharani (1993). Fonologi generatif: teori dan penerapan. Kuala Lumpur: Dewan Bahasa dan Pustaka. ^ Clynes, Adrian (1997). "On the Proto-Austronesian "Diphthongs"". Oceanic Linguistics. 36 (2): 347–361. doi:10.2307/3622989. JSTOR 3622989. ^ Adelaar, K. A. (1992). Proto Malayic: the reconstruction of its phonology and parts of its lexicon and morphology (PDF). Canberra: Pacific Linguistics. doi:10.15144/pl-c119. ISBN 0858834081. OCLC 26845189. ^ "Universal Declaration of Human Rights (Bahasa Melayu (Malay))". United Nations Human Rights. Edwards, E. D., and C. O. Blagden. 1931. "A Chinese Vocabulary of Malacca Malay Words and Phrases Collected Between A. D. 1403 and 1511 (?)". Bulletin of the School of Oriental Studies, University of London 6 (3). Cambridge University Press, School of Oriental and African Studies: 715–49. C. O. B. 1939. "Corrigenda and Addenda: A Chinese Vocabulary of Malacca Malay Words and Phrases Collected Between A. D. 1403 and 1511 (?)". Bulletin of the School of Oriental Studies, University of London 10 (1). Cambridge University Press. Vladimir Braginsky (18 March 2014). Classical Civilizations of South-East Asia. Routledge. pp. 366–. ISBN 978-1-136-84879-7. Wikimedia Commons has media related to Malay language. Wikivoyage has a phrasebook for Malay.